Brick or stone patios look great, but getting them level is a real trick. Unlike concrete with poured patios, the bricks don't find their own level, so you can end up with a wavy, tilting surface that doesn't accommodate lawn chairs very well. If you get your sand underlayment completely level first, that will level the entire patio. How do you lay a level on sand and get a true reading? This plan relies on staking a ``web'' of strings a few inches above the sand underlayment, leveling the strings, and using that as a guide to level the sand. This can be used for new patio construction, or to re-do your existing patio by pulling up all the pavers and laying new sand under them. Clear out the area where the patio will be. Spread the sand over the area to a depth of about three inches. Use your snow shovel to drag over the sand, getting it as close to level as you can by visual assessment. Pound wood stakes at every corner, just inside the perimeter of the sand. 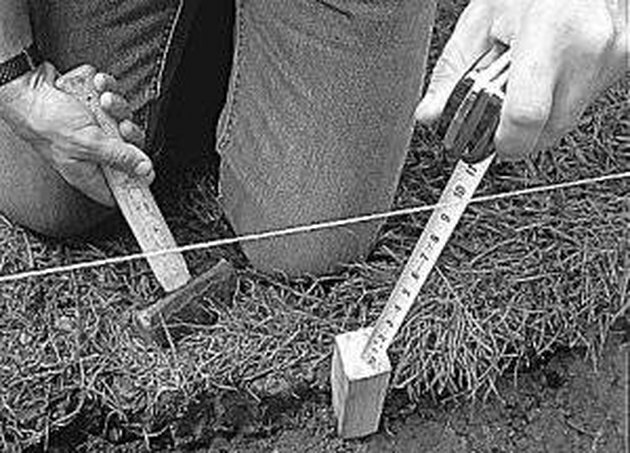 Then pound additional stakes at the middle of each side of the area, so that each stake has a corresponding stake across the patio. String the twine between the stakes at the perimeter, so it follows the shape of the area. The string should be roughly six inches above the sand. Also string the twine between the opposing corners and opposing sides, forming a criss-cross pattern over the whole patio. Make sure the strings are pulled tightly, so they're as straight as possible. Hang your string-level on the string between two of the stakes at the perimeter. Slide the string up or down on the stakes until the string-level shows that it's a level line. Repeat the process for each span of string between the stakes, including the ones spanning the middle of the patio, so the whole "web'' of string is level. With the tape measure pointing down vertically, measure from the string to the sand at various points to determine what the most common distance is. Decide on what distance you're going to use as your standard. It should be around six inches, based on how you initially positioned the strings. Settle on one number and use it consistently throughout. With your shovel, smooth and adjust the sand to get it all to six inches below the string. Take care not to disturb the string with the shovel. Once you've got the sand as level as you can as measured from the string, spray the entire area with the hose, using the finest spray setting so it doesn't move the surface of the sand. Soak the area well, let it dry, and then repeat the process once or twice more to allow it to settle and compact completely. Once dry, it's ready for patio pavers.